"Let the kids help with filling and sealing the pastry for these crispy fruit-filled treats." I had a difficult time rolling a 1/4 pie crust into a circle. I also think adding some sugar to the outside might make it tastier. Overall, taste level was as good as I expected. 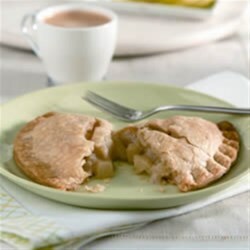 Instead of "turnovers," I guess I made "baked apple pies," but shaping them differently was the only change. The Splenda provided just enough sweetness. So very delicious! I thought I wouldn't like the consistency of the filling - but in the final product it was Just Right! These are great! Baked apples and Splenda seem to go =very= well together... mmmmm... plus the slightly salty crust... yummers. Highly recommended!